Turtle cookies are the best Christmas cookies. 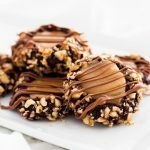 The recipe uses a chocolate cookie dough, crushed pecans and gooey caramel making each bite taste like the candy! In a medium bowl, whisk together flour, cocoa, and salt. Set aside. With a stand mixer (or hand mixer), beat butter and sugar on medium speed until light and fluffy, about 2 minutes. Add egg yolk, milk, and vanilla and mix until combined, one more minute. Scrape down sides of the bowl if necessary. Reduce speed to low and slowly add flour mixture until just combined. Once dough is chilled, preheat oven to 350° F. Lined a baking sheet with parchment paper and set aside. Place egg whites in one small bowl and chopped pecans in a separate small bowl. Roll chilled dough into 1-inch balls, dip in egg whites, and then roll in pecans. Place balls about 2 inches apart on prepared baking sheet. Using a 1/2 teaspoon measuring spoon, make an indentation in the center of each dough ball. Bake until set, about 12 minutes. Once cookies are removed from the oven, gently re-press the indentations. Prepare caramel filling immediately. Place unwrapped caramels and cream in a bowl. Microwave together, stirring occasionally, until smooth, about 1 to 2 minutes. Transfer cookies to a wire rack and fill each cookie indentation with about 1/2 teaspoon of the caramel mixture (it's okay if the cookies are still warm). Place chocolate and shortening in a small bowl. Microwave together, stirring occasionally, until smooth, about 1 to 2 minutes. Transfer melted chocolate to a ziplock bag. Snip a very small hole in the corner of the plastic bag. Drizzle chocolate over the cooled turtle cookies. *I put the pecans in a food processor and pulsed for 20 seconds. Store cookies in an airtight container at room temperature for up to a week.